The primary instrument of the observatory is the Cooley Telescope. 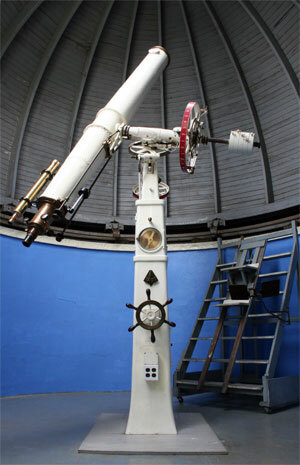 It is a nine-inch Warner and Swasey refractor built in Cleveland, Ohio and graced with John Brashear Co. optics. Dedicated at Hiram College in 1901, it is a fine and unique example of turn of the (20th) century astronomical telescope technology being complete as manufactured. 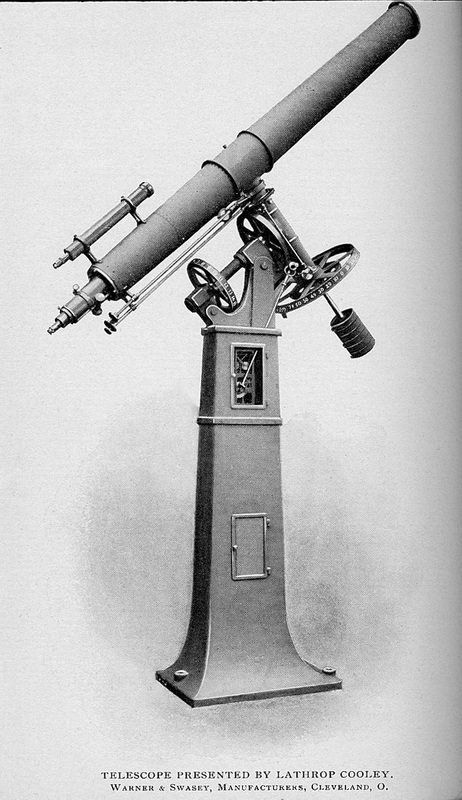 As is customary, the telescope was named for the benefactor who provided it, Lathrop Cooley. See our History page for more about Mr. Cooley. Cleveland’s Warner and Swasey and their interests in astronomy – a PDF document. Our instrument contains and employs its original optical and drive components made by leading manufacturers of the time. Despite its age the Cooley’s optics are excellent and provide impressive views of solar system and deep-sky wonders. Continued use of this instrument in astronomy is its highest and best purpose. Here are the basic stats concerning the Cooley Telescope’s objective lens: Aperture = 9 inches (229 mm), Focal Length = 131 inches (3,327 mm), F = 14.6. Lens elements: crown glass and flint glass. Made by the John Brashear company, Pittsburgh, Penn., a leading manufacturer of telescope optics of the day. What is the telescope’s “power” or magnification? It depends. Magnification is a function of the focal length of the objective and the focal length of the eyepiece. To calculate a telescope’s “power,” divide the objective’s focal length by the eyepiece focal length. So with the range of eyepieces we commonly use, the magnification ranges from about 30X to 250X.